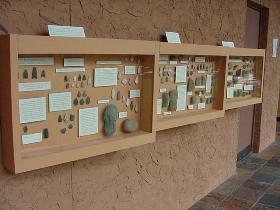 The Bennett History Museum has a large collection of artifacts presenting the Native American cultures that preceded the European arrival in the Southeastern U.S. Projectile points, atalatyl weights, chunky stones and pottery shards are among the cultural remains of ancient cultures. Carefully arranged according to the periods that gave rise to their forms, a large display of artifacts are located in the glass hallway leading to the Hall of Ancients. They are examples from four large collections totaling more than 6,000 items found in northwest Georgia. These artifacts were donated from the collections of Margie and Tommy Dunn, Buck Cheeves, Hank Hitt and Jack Richardson. The more significant pieces are exhibited chronologically and described in detail. 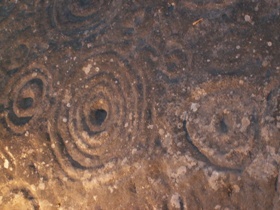 The largest artifact in the Hall of Ancients is the petroglyph. This ancient and mysterious carved rock was found years ago on the Cline property, located in the Hickory Log area of Cherokee County. The Longhouse contains artifacts and text panels telling the story “Of Sky and Earth,” a narrative of the earliest encounters between Europeans and the peoples of the Southeast with accompanying artifacts. This is funded by Georgia Power. The physical appearance of artifacts changes abruptly with the European arrival in the late 15th century. The deerskin trade that dominated the lives of European traders and native peoples alike is characterized by trade goods such as beads, copper pots, and iron or steel tools such as tomahawks (or “hawk-bills”), guns, and ultimately plows, locks, nails, hoes, froes and shovels. Until the American Revolution, the deerskin trade was Georgia’s main economic enterprise. The Age of the Deerskin Trade brought not only changes in the physical life of Native American peoples, it also transformed European life as well, introducing new materials, attitudes and political ideas, as philosophers, writers and manufacturers incorporated the “New World ” and its many cultures into their frame of reference. The Sellars Tool Collection suggests the revolution wrought by iron that occurred when American Indians were introduced to iron implements, and their New Stone Age culture abruptly ended.